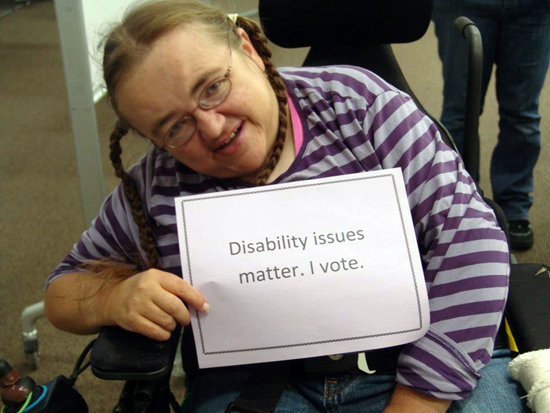 Why are people with disabilities less likely to vote than their non-disabled peers? People with disabilities are often socially isolated, which makes them less likely to be asked to vote by friends, family members, co-workers and political organizations. People with disabilities often have less access to resources that are linked to higher voter turnout, such as income and education. This can lower their perception of their own political value. People with disabilities can be discouraged by barriers involved with getting to polling places and using voting machines and materials, both of which make voting more time-consuming and difficult. These barriers may create a perception that people with disabilities are not fully welcome in politics. People with disabilities are part of a community that is usually more disconnected than other marginalized Social marginalization happens when a group of people are denied equal and adequate opportunity to determine their treatment by the members of the broader society. It usually includes the lack of representation, recognition of rights and equal redistribution of resources and services groups. The term “disability” is used in politics to cover a huge range of conditions, not even specifying between physical and mental disabilities. This diverse community is often overlooked just for this reason. Many groups advocate for rights for people who have just one of the many types of disabilities. For example, there are groups for people with cerebral palsy and groups for people who are blind or deaf. Providing access to voting for all of these groups is a communal struggle that is ongoing. Access to the polls and the ability to vote are very important parts of being a U.S. citizen, so why is it still sometimes very hard for people with disabilities to vote? For Minnesota, the 2010 Census revealed that approximately 15% of the voting-age population are people with disabilities, similar to national statistics. People with disabilities in Minnesota can choose from the same forms of voting available to all Minnesotans, which include voter registration, no-excuse absentee voting A program that allows any voter to vote early by mail or in certain polling places and curbside voting Election judges will bring a ballot to your car if necessary in addition to regular voting at the polling place. People with disabilities also have a right to have assistance at the polling place. An Auto MARK ballot marking machine is available for a person with a disability if they need additional accessibility options. While several voting options are available to people with disabilities, many still want to cast their vote at the polling place. The majority of people with disabilities nationwide prefer to vote in the polling place, whereas only about a quarter prefer to vote by mail and even fewer prefer online voting. Anyone under guardianship When someone is legally responsible for the care of another can vote unless a court order has specifically revoked their right to vote. People with disabilities living in residential facilities have options they can use to register to vote or to cast their vote. The Arc Greater Twin Cities Self Advocacy Advisory Committee aims "To secure for all people with intellectual and developmental disabilities and their families the opportunity to realize their goals of where and how they live, learn, work and play." The group demonstrates the importance of civic engagement for all people, including those with disabilities. It is important that people with disabilities know their voting rights. If they encounter any problems at the polls, they can call the Minnesota Disability Law Center Voter Hotline at 612-334-5970 or 1-800-292-4150 or Election Protection at 866-OUR-VOTE and have questions answered by a lawyer. A formal complaint about a poll location can also be made with the county auditor or municipal clerk for the polling place or directed to the office of the Minnesota Secretary of State.